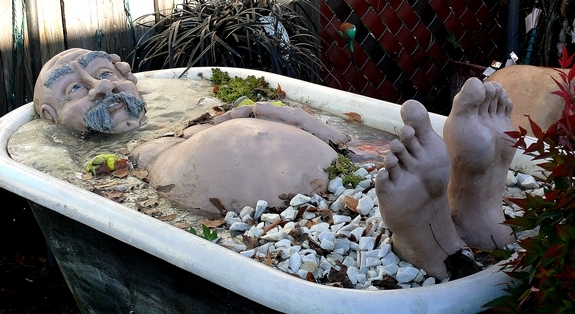 Holiday decorations are up around the neighborhood, people really go all out here. The extreme cold has finally passed and we are back to our typical 30ish degrees and rain. We kicked off Friday night at The Horse Radish with our friends. This is an adorable wine bar in the city of Carlton. We had a bottle of some really yummy Pinot Noir but we were also eying the selection of cheeses they have…wow. After The Horse Radish we headed across the street to a quaint French restaurant called Cuvee. 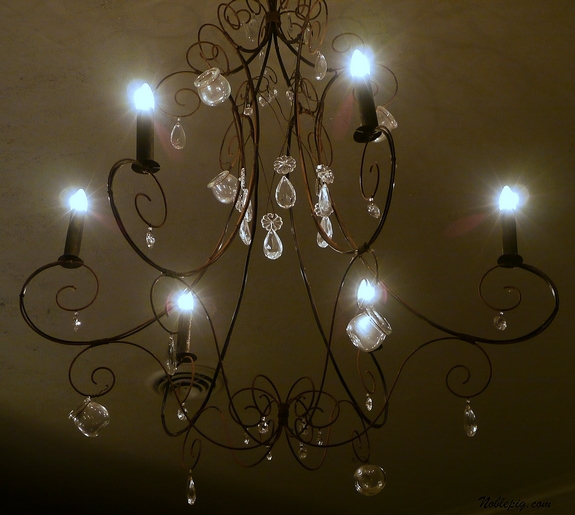 It was too dark to take pictures of the food but here was the chandelier…very pretty. We really enjoyed our meal. We had Mousse de Foie de Poulet, Pommes Frites, Boeuf Bourguignon, Rib Eye avec Pommes Frites, Crab Juniper and the Poisson du Jour which was salmon. For dessert, Port, French press coffee, creme caramel and Gateau au Chocolat…amazing, amazing, amazing. 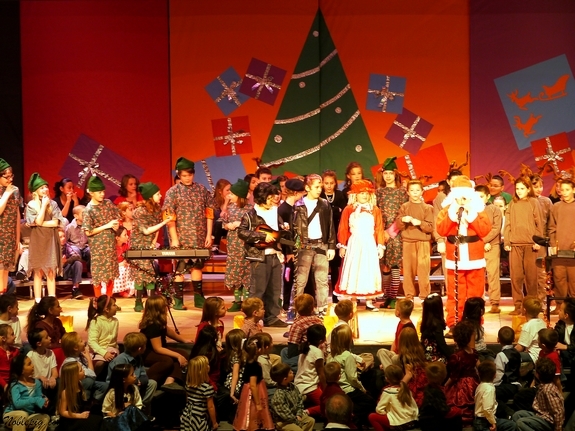 My kids were in a play this past week, “Elfis and the Sleighriders”. It was darling. My favorite drugstore holiday candy is finally here. I opened this box before I checked out. I had to get some of these as well, I love them. 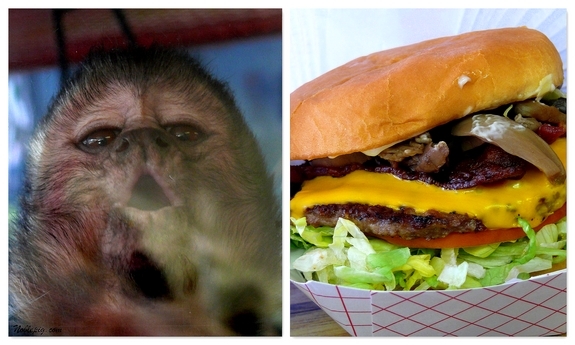 We had some mushroom burgers at Alf’s Ice Cream & Burgers in McMinnville or what I call the monkey restaurant. Yep, there’s a monkey there, here he is scoping out my food from behind the glass. This guy should really take it inside. Elfish and the Sleighriders? Sounds like a hoot and holler to me, did you video this? 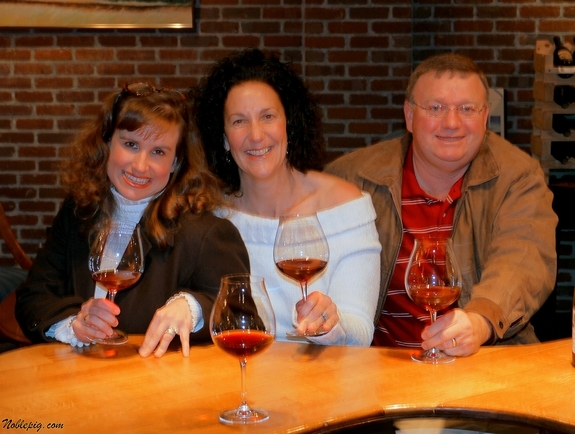 OOOH, your weekend of wine and food makes me want to go back to your area very soon! You are having a very good time in your new home, aren’t you? We are thankful the weather is back to its’ normal 30 ish temperatures, no more hauling out gallons of hot water to the livestock…more time for baking all things yummy, like the last recipe you posted! Wow what a fantastic house. Some people really get into the spirit don’t they. You sound like you are really getting into the Christmas spirit too. 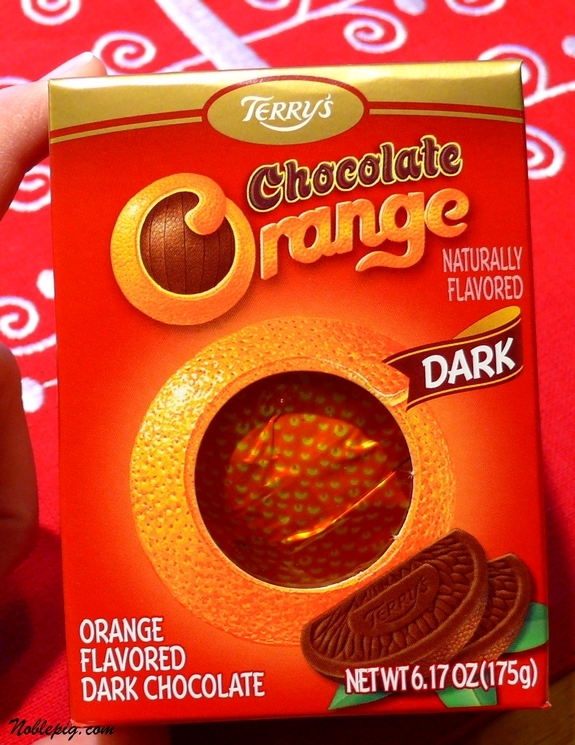 And we have something in common except a love of blogging — Terry’s orange chocolate! LOL, that last photo is a hoot! The burger looks awesome. I’m betting Grumpy would love a couple of those! The monkey creepy, the guy in the tub, too funny!! My weekend was mostly rain, laundry and whining kids. I’ve heard about Cuvee! I’d love to try it sometime when we get back out to the west coast. I have to admit: I was a little more creeped out by the monkey in the restaurant than the bathtub guy. LOL! I had to laugh when I read this…every year my mother gives my sister and I Queen Anne Cordial Cherries. It’s one of my holiday traditions by now. …planning my next trip….to Oregon!!! 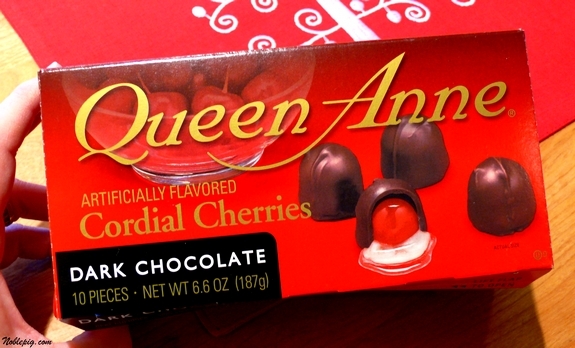 I think of my grandfather every time I see those Queen Anne chocolates. He loves them. Also…I always give Michael and Shannon those chocolate oranges in the toe of their stockings. They’ve come to expect them! 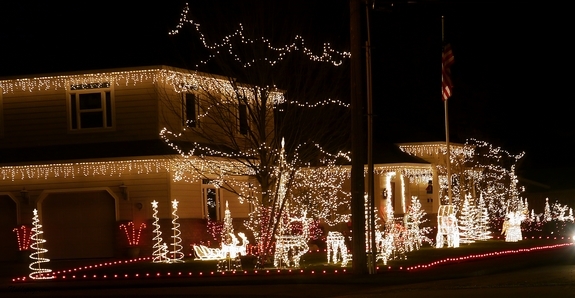 We put up Christmas decorations inside and out – we’d procrastinated as long as we possibly could. Also made the most amazing chicken curry. It’s such good cool weather food. Would have loved the boy’s play and as for the monkey – he’s just too cute! Looks like you had a fabulous weekend! I was busy with partying, shopping and movie watching! A monkey and a man in a bathtub. You have some interesting places you go! That monkey is crazy hilarious. Wow..what a yummy and fun blog you have! That reminds me to get my hubby his chocolate coverd cherries. Thanks! Oh and I saw this wreath and thought of you. I love that name the Horse Radish, you and your friends are adorable, that dinner sounds amazing and the monkey cracked me up to no end. You’ve had another busy weekend. You really should get out more :-). That last photo is really something. I think I’m laughing. I laughed at that last picture too. People around here decorate a lot; maybe it’s a cold weather thing? Those cherries were my mother-in-law’s favorites. Great post. Loved all the photos. I love chocolate covered cherries! We always had a box or two at Christmas time when I was little. Now, I’m going to have to go get one today. Fun weekend! Love the last picture! What strikes me is how well your family has just moved to a new town and it seems like you’ve been there forever. Great shots, I love life in the PNW don’t you? Your weekends are very interesting. You seem to have settled in a very interesting area of Oregon. We spent the weekend in a very thick fog. Finally today the fog has lifted. All in all it was a yukky weekend for us because of the weather. I’ve been to Alf’s – they have tasty burgers. I feel sorry for the monkey. Great pictures. planning next weekend may would be unforgettable.